Let’s do one of those crazy improv exercises. Someone throw out a suggestion. A place. Could be anywhere. 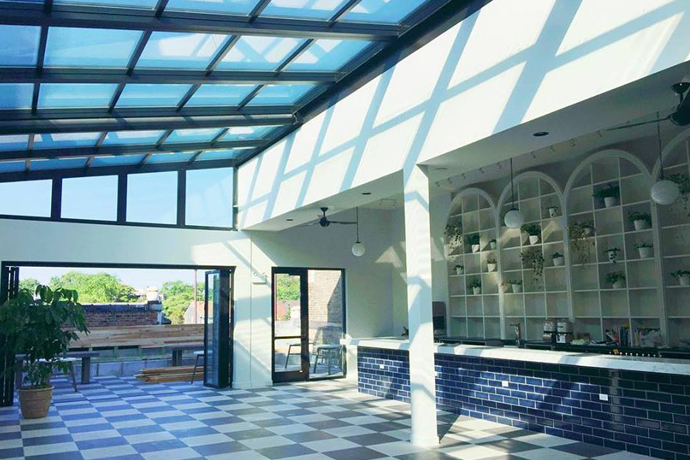 Okay, did we hear “iO Chicago’s new theater/beer garden/bar/comedy multiplex that’s now soft-open in Lincoln Park”? That’s good. We can work with that. Yes, that fabled training ground for the likes of Tina Fey and Chris Farley has found itself a new home in an old furniture warehouse. And now, it’s a two-story good-times factory. First, it’s got improv classes where the Vince Vaughns, Amy Poehlers and Jason Sudeikises of tomorrow hone their God-given ability to make you snicker like a monkey. Second, while you probably don’t get to improv much these days, it’s still a good place to send out-of-towners who want to feel closer to the spirit of Chris Farley. The Chris Farley Cabaret theater should do. It’s a snug, minimalist stage on the second floor. Third, and most importantly, it’s got a loft-like tavern with brick walls and lots of exposed timber, plus a big beer garden outside. Stop in pre- or postshow for a banh mi flatbread and some margaritas made with ghost pepper bitters.